I have always felt challenged by Art, from childhood I felt unable to create it, any attempt resulted in what I can only describe as failure on an epic proportion, my learning or lack of it left me without the knowledge or vocabulary to communicate with anybody beyond a very superficial level about Art. My lack of confidence grew from not trying to produce or talk about it to believing that it was not relevant to me in any way, rather than allowing myself to feel inadequate , I avoided looking at it almost entirely. With change I have found myself on a quest to find sense, in myself and in the world. I don’t understand and I want to, after a long time avoiding any questions over anything beyond the mundane and the simple I am now on an all consuming quest, it’s an indulgent one, it’s all about me, but I am compelled to pursue. Everything is open to question, nothing is off-limits, I challenge myself, relentlessly, I want answers and I want to understand, it is a madness of sorts, not obvious, not a screaming in your face sort of madness, but a quiet disquiet, a search for sense. 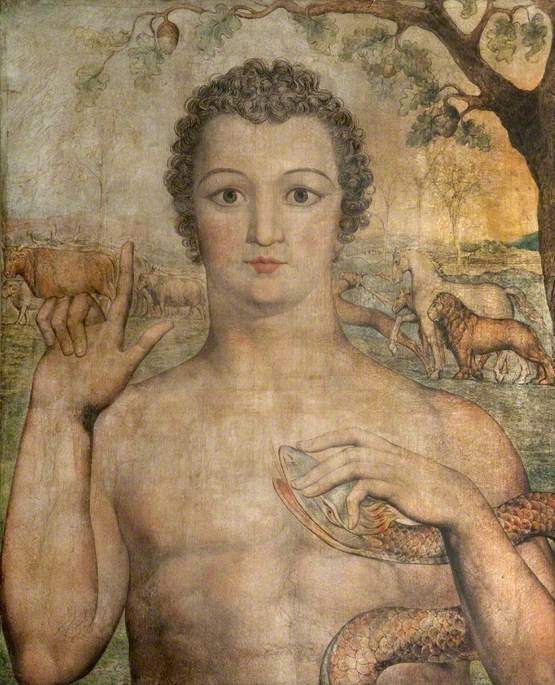 I came across a painting by William Blake, Adam Naming the Beasts, I felt something very striking in the image, though God has no place for me in my beliefs a story and an image brings me some understanding of myself and my path. Adam lived in the Garden of Eden, all was provided, he lived comfortably,he had no need to think for himself, no need to explore. He lived like a child, unknowing, unaware, accepting. Eve was tempted by the Serpent, the fall followed. Innocence ended. Adam stands alone in the picture, naked, open, gaze fixed forward, no looking back, he is master of his own destiny. Like Adam I have fallen, innocence is at an end, the Garden of Eden was not mine, it did not belong to me, nor I to it, it was illusion. I am free to explore this World, free to search and journey and find my own place in it. To feel, to choose, to experience, to live. It is my choice, my destiny how I make it happen, what power lies therein, this is the gift. The OK Lady & Me.